I have a lot of opinions about burgers. Like a good burger doesn’t need bacon. American is the singular best cheese on a burger. Period. This is not up for debate. (Hashtag: #NeverCheddar) And Father’s Office is absolutely not the number one burger in LA. But I’m not going to dive into the taste just yet because Burgers Never Say Die evokes the intangibles I love about burgers. That feeling of summertime and childhood and hanging out with friends. Laughing over Coca Colas. (Hashtag: #PepsiSucks) Sharing French fries. Giggling about nonsense in a crowded booth as you catch your crush’s eye across the table. Burgers mean cookouts and holidays and family gatherings. They’re life’s little indulgences, consumed with a hearty helping of camaraderie, not caviar. Think of how great it feels when someone says, “Hey, let’s grab some burgers.” There’s an immediate comfort to it. And a soft, toasty bun is like a big carb hug. Instantly satisfying as soon as it hits your lips. Believe it or not, that’s why fast food burger joints work. They’re familiar, accessible… and it just feels good. Hell, that’s what McDonald’s banked on and built an “over 99 BILLION [burgers] served” empire. 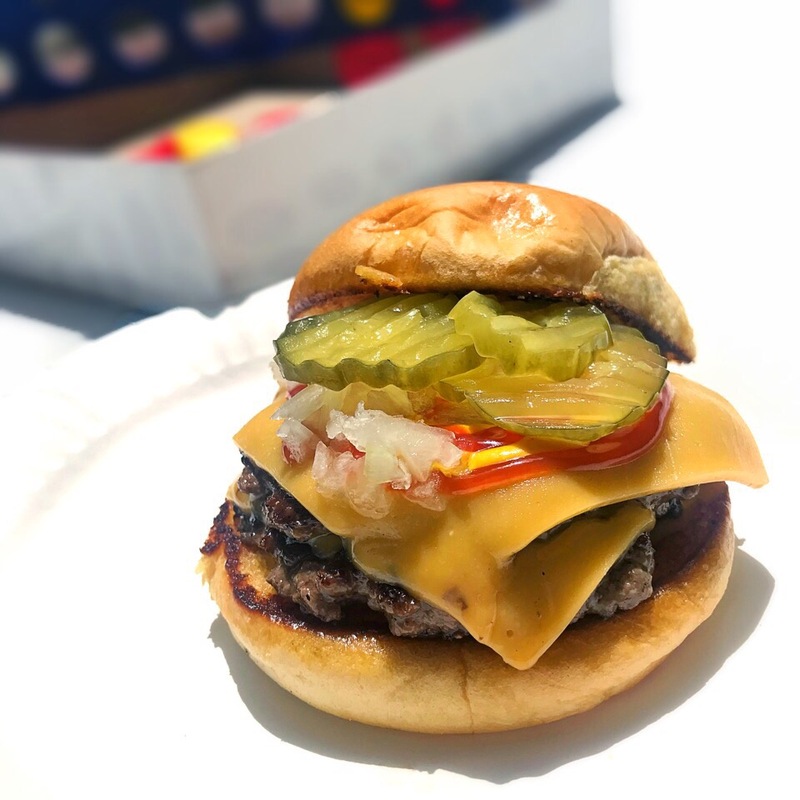 Burgers Never Say Die encapsulates all of that but with a damn good burger to boot (sorry, Mickey D’s) in the heart of one of the most familiar settings possible to chow down on these cheesy delights — a backyard. It’s Shawn, the founder and cook’s, backyard and it’s got a warm and inviting lemonade stand feel, where his friends take orders and tend to the ‘customers’ (for lack of a better word, because you don’t feel like a customer at all). It’s like you’re just dropping by for a visit, and your old pal Shawn is going to toss some burgers on the grill for you. Thanks, Shawn. There’s folding tables and Fanta (FANTA, you guys!) and Connect Four and the best crafted burger in town. Lined up on a propane flattop are seasoned mounds of freshly ground beef from a local butcher that Shawn smashes down with pitch perfect proficiency (despite any lack of formal training) to yield that coveted crust on both sides. 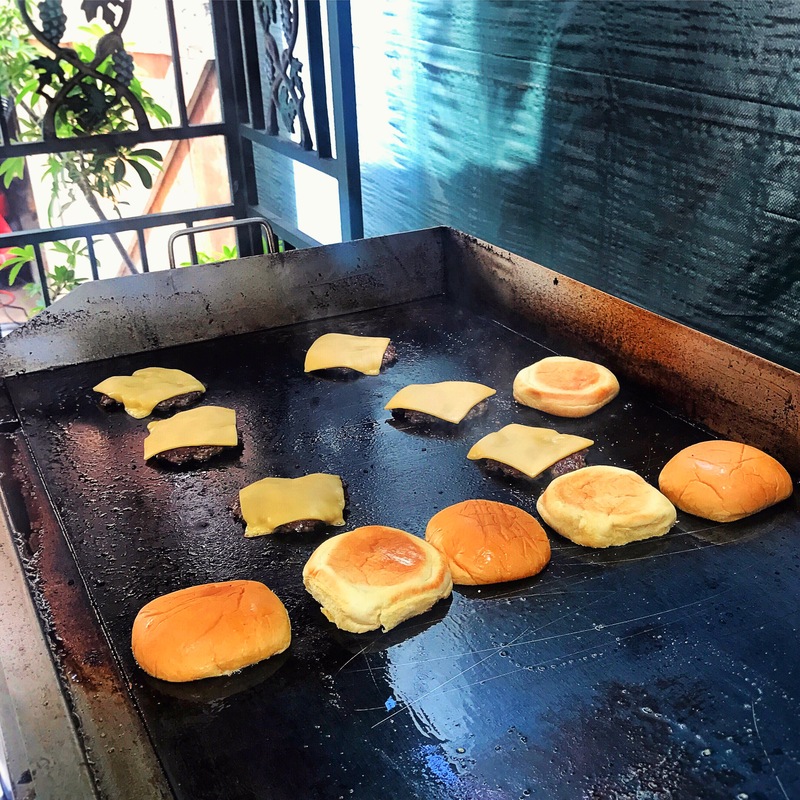 While the patties are sizzling, their juices glistening on the grill and punctuating the air with mouthwatering scents, he adds thick slices of American cheese that blanket the meat as it oozes into every nook and cranny, sticky strands languishing over the edges. Like I said, it melts the best. PERIOD. The rest of his toppings are your standard fare — ketchup, mustard, pickles and minced onions — designed to complement the meat, not overpower it. Also as I said, take a hike, bacon. And while we’re at it, lettuce and tomato, you can hit the pavement, too. Go on. Nobody wants you here. 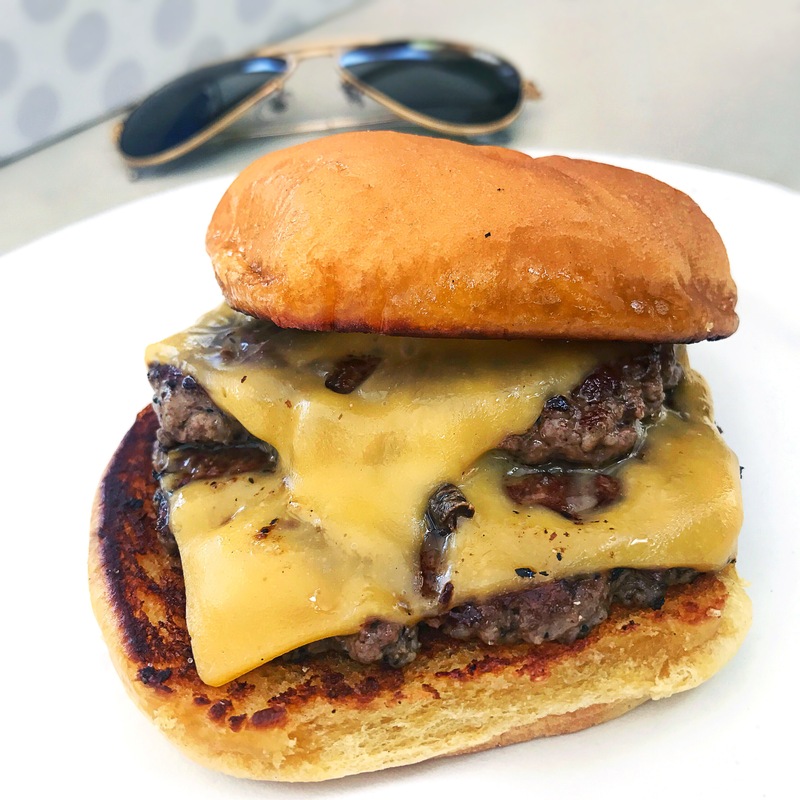 Burgers Never Say Die gets it right with simple ingredients that showcase a skillfully cooked burger and shrouds it in a fluffy Martin’s potato roll after a quick jaunt on the flattop for maximum toastiness. The result is a symphony of textures and flavors so buttery and rich, it’s reminiscent of a grilled cheese with two juicy patties stuffed inside. Incidentally, they do offer a special called ‘The Colossal’ with a whole grilled cheese sandwich tucked between a double-stacked burger, but I suggest skipping the middleman (no pun intended) and just ordering two of their plain cheeseburgers. They’ll remind you of 4th of July and epic hangs and moments that make you smile. And I guess that’s what Burgers Never Say Die is really selling — nostalgia and soothing comfort for the soul. No shaved truffles required. Burgers Never Say Die is Atari in a world full of Play Station, and while graphics have come a long way, nothing beats munching ghosts around an 8-bit Pac-Man board. 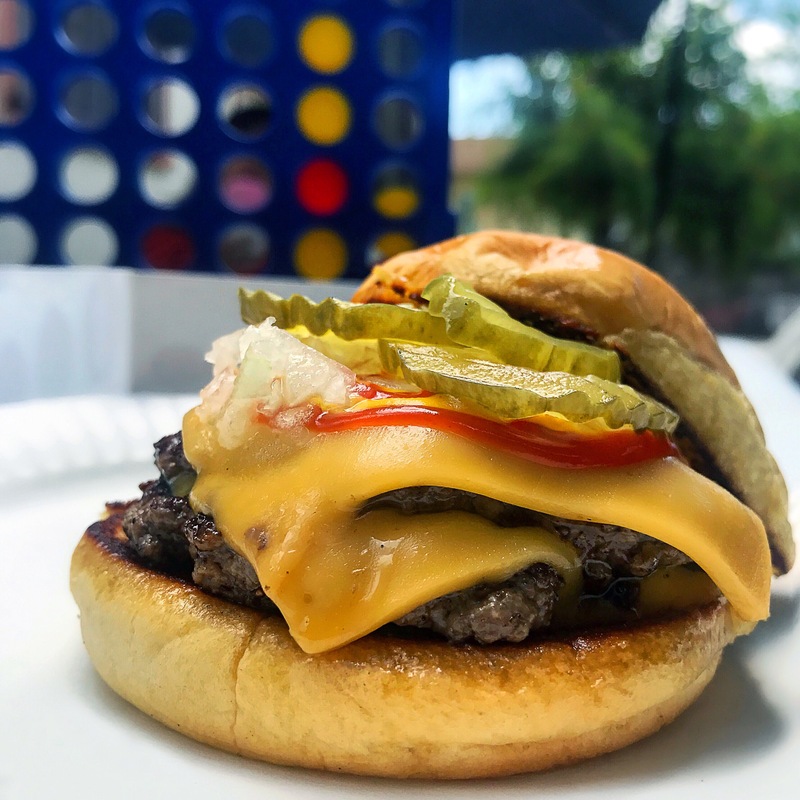 Or, a friendly game of Connect Four while you eat one of the best burgers you’ve ever had in a backyard that feels an awful lot like home. Burgers Never Say Die operates Sundays only from 12-4pm. Email info@burgersneversaydie.com for further details and location information.